There are several different kinds of arcade players in life. Some like to stick to the pinball games, other like the fighting games and some like the gun games. If you are a gun person, this game maybe for you. 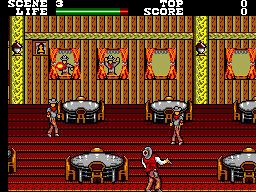 The object of the game is to shoot the bandits and save the town. After all, you are the sheriff. First, you have to find a working light phaser and seeing most of them are 20 years old, it could be a challenge. There are a couple different scenes. One is when you are walking through a town. Another is on horse back and you shoot the bad guys before they pass you. Then there is an impossible bonus stage. 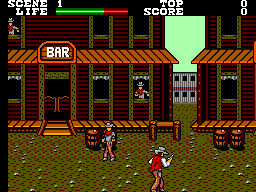 You fight in the saloon and there is an end boss. The stages are not to hard, but the last stage is challenging. It is much more difficult then the normal stages. The graphics are solid for an eight bit home console. The only thing that is frustrating is some of the good guys look like bad guys and vice versa. They pop up in random spots, then they either put thier hands up or pull out a gun. If you shoot a good guy, your life is drained. There has been times when I died from shooting to many good guys. Look at the right screenshots, the guy in the second window is a good guy and the rest are bad guys. Get my point. I like the music, it is up beat and matches the gameplay. The gun sounds when you shot someone or you hit something you are not suppose to. It also lets you know when you get shoot. This all up to how good of shape your 20 year old light phaser is. The only negative is the impossible bonus stages. I have never beat them. One, you have to shot 70 coins in a certain amount of time. The coins fly up in a bundle and down to the floor. How can you shot all of them. What were the game designers thinking. They're probably up late at night laughing about the time they put an impossible bonus stage in this game. Well, all gun games have a good replay value in my book. Your reaction is everything when it come to beating this game. 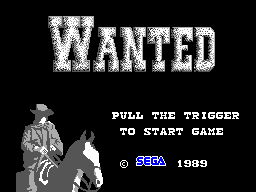 This is one of the better gun game for the Sega Master System. My personal favorite is Gangster Town. Build your collection of gun games for the Sega Master System. The gun is what makes people still go to the arcade and put their quarters in. It is a challenging and fun game. To bad there was not a two player mode.